SINGAPORE - Facebook and its related apps Instagram and WhatsApp went down on Sunday evening (April 14), with several users taking to other social media platforms to say they were experiencing difficulties. Facebook began to experience issues at about 6.30pm, according to tracking website downdetector.com. The site's outage map showed several parts of Europe, South-east Asia and North America were affected. Malaysia, Indonesia, and the Philippines were also affected. In a tweet at about 8.25pm, telco M1 noted that Facebook and the other apps were down. “All of M1 services, including mobile data, are running as usual,” it added. As at 9pm, issues with the three services appear to have been resolved for Singaporean users. Facebook has not released any statement with regard to the outage. Ms Karyn Lim, 44, told The Straits Times that she was affected by the outage for about an hour. “Luckily, it happened after I had knocked off from work. I would surely have got very frustrated if it had happened during working hours,” said the photographer’s assistant, who explained that she needed to reply to customers using WhatsApp. On Twitter, the hashtags #Facebookdown and #Instagramdown were trending. It is reported that Whatsapp, Facebook and Instagram services are down in Singapore, and globally. All of M1 services, including mobile data, are running as usual. According to downdetector.com, there were more than 14,500 incidents of people reporting issues with Facebook at the peak of the outage, but that figure dropped to less than 900 reports. The outage monitoring website also showed that, at the peak on Sunday, there were more than 3,000 incidents of people reporting issues with WhatsApp and more 7,700 with Instagram. User Zincjunyi tweeted at about 8.15pm that they had been unable to access Facebook and Instagram in Singapore for about two hours. Another user, JPadillaBarreno, tweeted at 8.10pm that he thought his account had been hacked. The disruption in service comes after a similar outage affecting Facebook and its apps last month, which the firm had blamed on a "server configuration change". 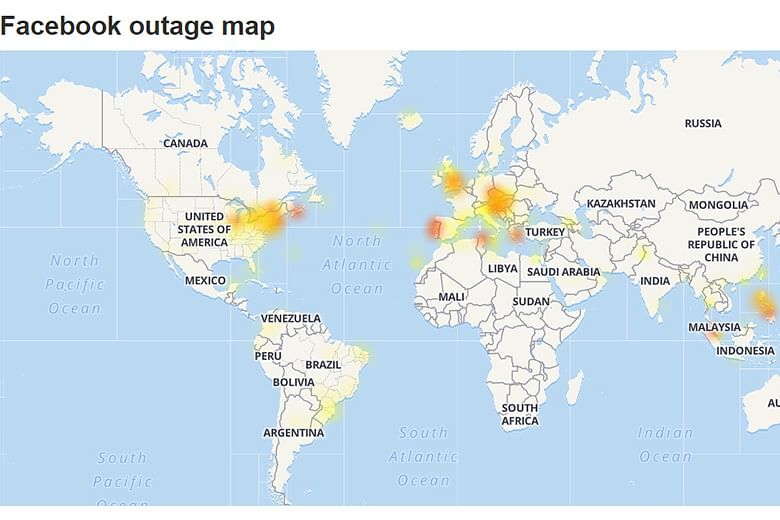 The outage affected users for some 12 hours in most areas of the world, including Singapore, with the biggest impact in North America and Europe, according to downdetector.com. As the outage continued on Sunday, many users took to Twitter to complain while others joked about the situation. Local blogger Lee Kin Mun, whose Twitter account @mrbrown has over 414,000 followers, noted at around 7.45pm that WhatsApp had been “flaky” since 6pm. In a second tweet at about 8.40pm, he said his teenage children were asking him about the fact that Facebook and its apps were down. “I told them, ‘Be of good courage. Stay strong. Live on’,” he said in his tweet. At about 8.40pm, user Rami Suliman tweeted “gone in the black hole” with the hashtags #FacebookDown #whatsappdown #InstagramDown, referring to the first-ever image of a black hole that was recently revealed. Accompanying the tweet was the now famous blurry orange image of the black hole, with the Facebook, WhatsApp and Instagram app icons superimposed onto the centre of the picture.